First, a note that twins have sleep patterns, and those patterns will change over time, very much as you are seeing right here in the example that you gave. It is totally natural for sleep patterns to change, and even though your son was sleeping well before, that pattern is subject to change, much to our chagrin as parents. You still want to keep a sense of routine and schedule. When your baby’s regression in sleep happens, remember that it’s totally natural. For example, your baby may be on the verge of a growth spurt, or teething, or some other developmental milestone that would then cause them to wake up more frequently during the night, or change their routine that you had gotten used to. Yes, you can definitely train them, and you want to train them to make sure that they establish good sleep habits. Remember that whatever actions you take, you are reinforcing the behavior that your child does or does not do, for better or for worse. So even inaction is in fact action, and is having an effect on your child’d behavior, even in the middle of the night. From what you described, it seems like your son probably is not waking up needing food, and as you’ve tried, a bottle with water, maybe don’t try feeding when he wakes up, but rather try a pacifier instead of a water filled bottle. Have you considered doing a dream feed before you and your wife go to bed? Say you put your twins down at 9:00, but you don’t actually go to bed until 11:00. Get your twins and feed them in the dark, or with low lights, right before you go to bed. They’ll be sleepy and might partially sleep through the feed, however it will give them an extra boost of food that just might help them sleep a bit longer and not wake up as much during the night. When your son or daughter does wake up in the middle of the night, ask yourself how are you reacting to that wakeup? Do you soothe them when they wake up in the middle of the night? Anytime you interact with your baby in the nighttime when they should be sleeping, you want to make this event as boring as possible. It’s not playtime, it’s not talk time. It’s not walk around the house time, it is lights out. It is sleep time. So you want to make sure that it is dark and conducive to rest. Try to leave your baby in the crib if possible. You can use the power of your presence and the power of a gentle touch to reassure and soothe your child that everything is okay, and they should fall back to sleep. When our girls were in their own cribs, we had their cribs positioned side by side, so that my wife or I could stand between the two cribs, and we could, by ourselves, with our left hand reach one baby and our right hand reach out and touch the other baby. This may work for you as well if can try similar positioning of your cribs in the nursery, so you can go in and soothe both twins without having to feed them. After a few nights of you intervening at night and of them not getting food when they wake up and they just experiencing something boring, they’ll start to fall back in the pattern of just falling back to sleep, or staying asleep. With our four children, we did not do the cry it out method, but rather favored sleep training. Sure, our babies cried, and that’s how they communicate with you when they’re so little. They can’t use words. Crying is how they tell you what they’re feeling. But instead of letting them cry it out indefinitely, we had controlled intervention, which we felt was more conducive to creating good habits with our babies, and safer for them. You should be able to tell the type of cry that your baby is making. Is it a serious “My arm is caught in the crib” cry, or is it just “I’m tired and I’ll be falling back to sleep shortly” cry? As you pay attention to the types and frequency of your child’s crying, you should be able to detect what the root cause of that crying is, and take action accordingly. When sleep training twins, you’ll be in and out of their nursery a lot, quickly soothing them and then leaving. An alternative is that you linger in the nursery so that they know that you’re there, and your presence is reassuring to them. This may start with you standing right next to the crib, and even slowly stroking their belly, or touching them. Letting them know that you are there and that everything is fine, and everything is safe. Eventually your sleep training evolves to where each night, you are farther and farther away from the crib until ultimately, you can put your child down or soothe them quickly, and then leave the room immediately, and your child is then able to fall asleep completely on his or her own. Should separate the babies for sleep training? 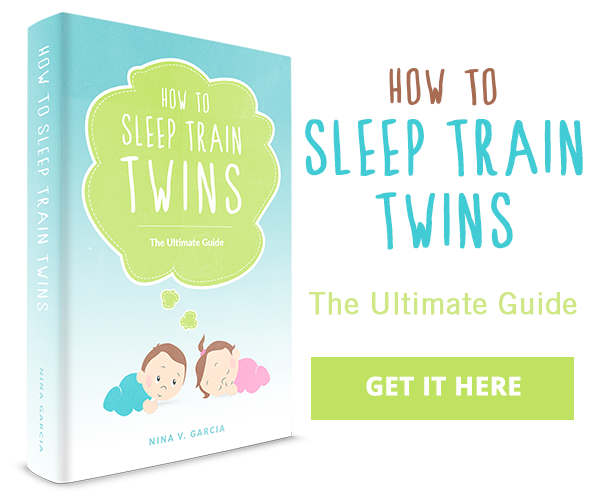 If one twin is waking up the other, you may consider separating them for sleep training. However, if that’s not the case, if one of the twins sleeps like a baby, as it were, right through the cries of the other, you can keep them in the same room. If they both wake up, ask yourself if you can soothe both babies at the same time. As I described earlier, if the cribs are right next to each other, you or your wife, should be able to soothe both twins at the same time. I would lean towards keeping them in the same nursery so that they can learn to fall back asleep when they’re interrupted during the night. Even if that’s a natural sleep cycle that they’re having, or if they hear other noises and wake up, you shouldn’t encourage them to always need help falling back asleep. If you separate them, you may have to the start over sleep training when you put them back together in the same room. It may take a few months for your children to fall back into a good sleep pattern. If you do nothing, they may do that naturally as a matter of course. However, to help establish and accelerate a routine that you would like to see, it is best to train them each night in the behavior and the pattern that you would like. If you leave them to their own devices, you may end up with a result that you’re not too happy with. Good luck as you sleep train your twins! I hope that you too may get a full night’s sleep shortly. Check out chapter 5 of my book, the Dad’s Guide to Raising Twins: How to Thrive as a Father of Twins where I talked in more depth about how to overcome the challenges of sleeping twins.